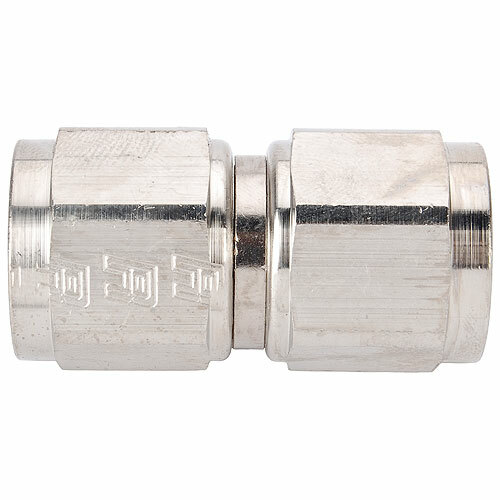 These fittings allow you to make professional 37° AN union connections. All aluminum construction featuring precise thread engagement and available in straight, 45°, and 90° configurations, great for customizing line routings. Features a high quality blue or black anodized finish or Russell's unique ultra-bright Endura finish that simulates the appearance of stainless steel. 640001 is rated 5.0 out of 5 by 1. Rated 5 out of 5 by Gramps from Not Red Not Blue Needed this coupler to add a gas filter for my new Holley. Fits Perfect and doesn't Leak..